In a pan, fry the moong dal slightly, until a nice aroma comes from it. Pressure cook rice and moong dal with milk and 2 cups of water for 4 - 5 whistles. Once the pressure releases. Mash it well and keep it aside. Meanwhile roast cashews in ghee. In a heavy bottomed pan,melt the jaggery by adding one cup of water and strain it . Now add the mashed rice to this jaggery and mix well. Cook in low flame. Add cardamom, pinch of salt and ghee . Allow it to cook for 5 mins. Finally garnish it with Cashews. Yummy sweet pongal,Happy Pongal to you. Happy pongal wishes to u Aruna,sooo tempting sakkarai pongal..
the pongal looks delicious and yum. Glad to be following a veggie blog (im one too)....:) Do drop into my space sometime...cya..
Sakkarai pongal looks delicious Aruna..
yummy pongal...looks delicious.you have a wonderful space and a lovely collection of recipes...Glad to follow u...drop into my blog when you have time....keep rocking. Happy Pongal wishes to you and your family Aruna. Second pic is tempting me to have a bowl of this sweet. Never tasted it before but I am sure it tastes super-yummy..Mouth-watering pictures..
blog and I like your recipies. 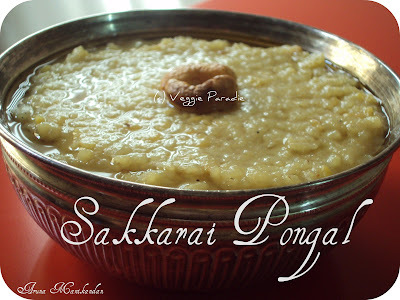 Yummy pongal and i dont add milk,i prefer without milk. I hope you had a lovely pongal..tempting pongal.. 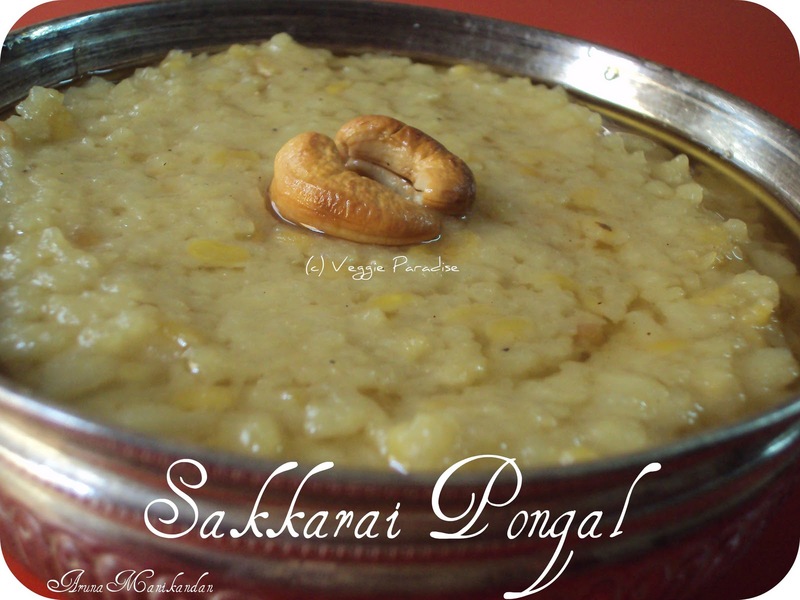 Happy Pongal Aruna..Pongal looks so drool-worthy..
the ghee floating on top is irresistible! first time on your blog! awesome! Ooo...sooo delicious...Reminds me of the sokkarai pongal I used to gobble from Murugan Idly shop during the chennai day..